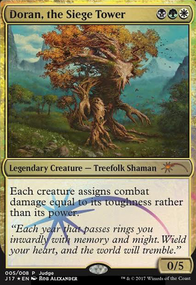 (1)(White): Creatures you control with defender can attack this turn as though they didn't have defender. Meekstone - Don't let anyone with big things untap! 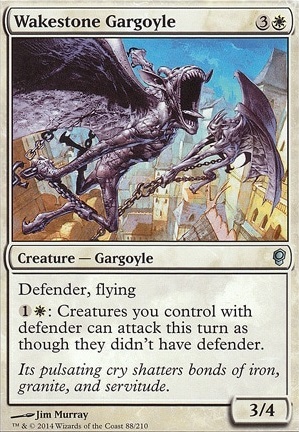 Discard your hand: Until end of turn, Howlstone Gargoyle may attack as though it didn't have defender. Current thoughts circle around designing gargoyle cards. Cards like Wakestone Gargoyle, Voidstone Gargoyle and Nullstone Gargoyle define their power basically by which material they're made of. So what if there'd be a gargoyle made from a material taken from the Howling Mine? This would be this creature. It's a slightly undercosted flyer with integrated symmetrical value and a seemingly harsh cost to be able to attack. Thoughts? That use of waxing moon is so off that I have to admire it. A card you might like is Bident of Thassa. Both the triggered and the activated ability are great with high-toughness creatures. I'm currently building gargoyle tribal and stumbled upon Wakestone Gargoyle. It would be a nice addition if you were to splash white. Oh, and from my turtle deck I've learned that Profaner of the Dead can be an awesome sweeper. 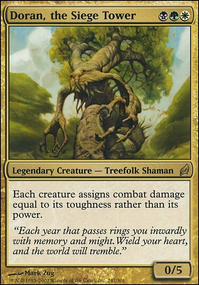 My first deck was a really terrible treefolk tribal deck back in the days of Lorwyn and Morningtide. Unfortunately, I was mostly building with second hand cards at the time and tried to make due with Traproot Kami, Doran, the Siege Tower, and (I think) Wakestone Gargoyle. Eventually I figured out what I was doing and went full on with Bosk Banneret, Dauntless Dourbark, and Leaf-Crowned Elder; although, the process took over a year. And ask for Wakestone Gargoyle and Rolling Stones while let my Defenders attack they're not attacking their defense so it that when I'm mostly swimming in ones and zeros. The dinosaur works but CMC awfully High. Thanks for taking a look at it! strangewayshwc on The best offense is a good defense, am I right? Enral, thanks for the suggestion. Homeward Path is definitely a consideration, although I haven't run into that issue yet. Usually once the drawing gets going I find Assault Formation one way or another. However, Rolling Stones was in the deck originally, as was Wakestone Gargoyle. 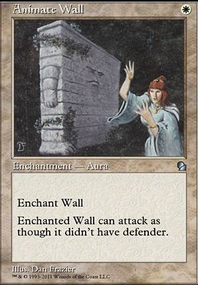 I decided to cut them because only roughly half of my creatures are walls (to take advantage of Rolling Stones), and neither gives the "assigns combat damage equal to its toughness rather than its power" clause.